It’s devastatingly hard to crush a skull. For all its lifelong fragility, the human skull is a significantly tough nut, which is why crematoriums have assistants on call to shove a stick into a pyre and ram it through what once was head, breaking it down so the flames licking at it can consume it quicker. As a child, I thought this skullcrushing was the reason these people are called Domes. They aren’t, even if it sounds like they are. Doms — or Masaanis, as they’re frequently referred to in North India, the ones who man the Masaans, the crematoriums — are a brutally marginalised people, one the rest of our frequently filthy yet eternally queasy nation considers too filthy to touch. 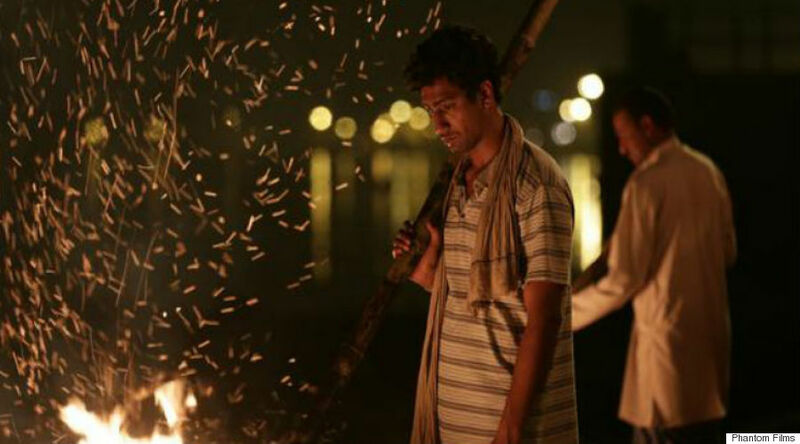 It is here that Neeraj Ghaywan’s directorial debut Masaan blurs the lines, and in striking relatable fashion: does untouchability even matter on the other end of a Facebook friend request? This story — enacted by debutants Vicky Kaushal and Shweta Tripathy — is a thing of beauty, something so pure and uncluttered that I could gaze at it for much longer than the film lets us, even though tinting this modern love with 90s nostalgia might be overkill. We’ve seen a lot of this awkward smalltown mooning before, but tthis is a romance with heart, stakes and even, sadly, stakes through hearts. Kaushal is sincere, understated and has eyes brimming with yearning, and Tripathy is effervescent enough to change the film’s intentionally murky tone merely with her eyes. She’s the best thing in Masaan. So good, in fact, is this romance that everything else in Masaan seems almost superfluous. There is a bitter yarn of blackmail, of policing moral and immoral, and while handled with much believability, this is an invariably hoary track. Sanjay Mishra is wonderful as an old translator who sits on the Benaras ghats while Richa Chaddha, playing his conflicted daughter, goes through the motions too blankly. An internalised performance is one thing, but here Chaddha, a usually fine actress, builds her character inconsistently and has trouble ‘acting’ when the performance demands it most. In one confrontation with Mishra asking what she’s blaming him for, she spits back the words “Ma ka” (“for Mother”) almost before he says it; in a film this given to naturalism, her performance jars. Perhaps that is why Masaan could ideally have been less committed to naturalism than it is to the poetry it aspires to. Avinash Arun, who directed the astonishing Killa recently, is the cinematographer and his work here is marvellously fluid, lapping by the water and diving under and above the obvious, his lens barely glancing at words typed on-screen and thus keeping us, the viewer, either alert or wistful. Yet for all its beautiful cinematography, the imagery in Masaan ends up soothing and never scorching, which feels like a bit of a letdown given the stunning potential on display. This is a lovely, lyrical film (with a great soundtrack by Indian Ocean) but I wish the song could have said more than que sera sera. The trap of telling a greater story using interlinked, dovetailing plotlines is a sticky one, and while Ghaywan acquits himself well, there is some irregularity that yanks the film down, especially when the varied threads of story are being glued together, which smells too convenient. Yet this film is an immense achievement for a first-time filmmaker, and must be applauded. At one point, a railway employee, played by Pankaj Tripathi, uses a line — about a station where more trains stop than start, a Hotel California-esque line on how it’s easy to get there but hard to leave — to try and impress a woman. Earlier in the film, Kaushal shyly, falteringly comes up with a line about how he loves his girl because she’s the youngest in her house, riffing off something she said, and we can see the grin run through his body as he feels the thrill of her succumbing to his line. These are the unforgettable bits. The lines work, Ghaywan. Forget life, death, blackmail, Benaras and corpses; balloon is all you need. Ur review is waterlight and precise yet again…..Well done!!! मसान फ़िल्म जो न खुल के हंसाती है, न रुलाती है, न परेशान करती है, न हैरान करती है, असली दुनिया के बीच लाती तो है, जोड़ती भी है पर उतना नहीं जितना आप चाहते हैं. हां तीन चीज़ें मसान को एक बार देखने लायक तो बनाती हैं. अभिनय, सिनेमेटोग्राफ़ी और बनारस की वह सेटिंग जिसमें दो साधारण और यथार्थ-सी कहानियों को बुनने की एक हद तक कामयाब कोशिश की गई है. मसान में वो बनारस नहीं है जहां महादेव की आरती के दौरान सुनहले होते घाट और शाही तेवर में मंत्रोच्चार करते पंडे हैं, हां सुनहला रंग तो मसान घाट का भी है पर ये पराजय और मातम का रंग ज़्यादा है. जहां मुर्दा शरीर भी हार मान चुका है और ज़िन्दा लोग भी हारे हुए हैं. और उन सबके बीच आपको मुग्ध कर देने वाला दीपक (विकी कौशल). दीपक की कहानी में आप उसके साथ होते हैं, शालू गुप्ता को फ़्रेंड-रिक्वेस्ट भेजने से लेकर, हंसने, इश्क़ लड़ाने, गुब्बारे उड़ाने, परेशान होने, रोने और उबरने की कोशिश करने तक. बातों-बातों में बशीर बद्र, मिर्ज़ा ग़ालिब और निदा फ़ाज़ली का ज़िक्र कुछ यूं है मानो वरुण ग्रोवर हम सब की ओर से उन्हें शुक्रिया कह रहे हों. और जिस किरदार के ज़रिए शुक्रिया कहलवाया गया है वो इतना प्यारा है कि वो दीपक को ना भी कह देती तब भी आप ग़लत कहने के बजाय उसे बेनिफ़िट ऑफ़ डाउट देना पसंद करते. श्वेता त्रिपाठी का किरदार छोटा मगर मुक्क्मल है. कई छोटे किरदार हैं, और बेहतरीन हैं. चाहे दीपक को देखकर गर्व से भर जाने वाला उसका बाप हो, या अपने पेशे से तंग आ चुका उसका भाई सिकंदर हो, या पुलिस ऑफ़िसर मिश्रा जी हों या फिर दुनिया को अपने ठेंगे पर रखने वाले तेवर के साथ झोंटा हो. फ़िल्म में एक जुआ भी है जिसे देखकर जितना मज़ा गंगा-किनारे वालों को आएगा, उतना ही शहरों की क़ैद में रहने वालों को. तीन पत्ती और चमकते-धमकते कैसिनो वाले दृश्य इस जूए के सामने पानी भरेंगे. यथार्थ का अपना मज़ा है. हालांकि इसके साथ एक जोख़िम भी है. यथार्थ कई बार आपको ख़ुद से बहुत जोड़ लेता है तो कई बार ये सुनी और कही जाने लायक कहानी होने के बावजूद मानसिक और जज़्बाती तौर पर आपको छेड़ नहीं पाता. देवी की कहानी के साथ कुछ ऐसा ही हुआ है. किरदार और अभिनय के मामले में फ़िल्म का ये हिस्सा दूसरे जितना ही जानदार है पर इस कहानी में न आप किसी किरदार के लिए सहानुभूति महसूस करते हैं न ही समानुभूति. मध्यवर्गीय मजबूर बाप विद्याधर के किरदार को संजय मिश्रा ने उतनी ही सुन्दरता से साधा है जितनी उन्होंने रजत कपूर की आंखों देखी में बाउ जी के किरदार को साधा था, पर बाप-बेटी की नज़दीकियों के बावजूद इतनी दूरियां हैं, यथार्थ ही इतनी संवादहीनता है कि उस कोण से जुड़ पाना मुमकिन ही नहीं हो पाता. ऋचा चड्ढा तो जैसे हैं ही नहीं, सिर्फ़ और सिर्फ़ देवी है. गैंग्स ऑफ़ वासेपुर में पैदा की गई उम्मीदों पर ऋचा पूरी तरह खरी उतरती हैं. उनके हिस्से नाम मात्र के संवाद हैं पर वो अपने हाव-भाव से ही बहुत कुछ कह जाती हैं. देवी की कहानी के सारे किरदार बहुत सलीके से निभाए गए हैं, पुलिस वाले से लेकर टिकट काटने वाले पंकज त्रिपाठी तक. मगर इस कहानी में आप उतर नहीं पाते, दर्शक भर बने रहते हैं. क्यों? इसके जवाब तक अभी नहीं पहुंच सका हूं. दोनों कहानियां रेलवे ट्रैक की तरह कभी समानांतर तो कभी एक-दूसरे को काटती हुई गुज़रती हैं. पहली बार जब देवी मसान घाट पहुंचती है, दूसरी बार तब जब गंगा में डूबकी मारते हुए झोंटा को शालू की अंगूठी हाथ लगती है और उसे बेचकर मजबूर बाप विद्याधर देवी को बचाने के लिए रिश्वत देता है. और तीसरी और आख़िरी बार संगम पर. दोनों कहानियों के संगम पर भी. अगर ये वरुण धवन का कमाल है तो उन्हें, और अगर नीरज घेवन का आइडिया है तो उन्हें एक बार दंडवत प्रणाम तो करना तो बनता है. मसान बिना किसी शक के एक अच्छी फ़िल्म तो है ही, पर ये असाधारण हो सकती थी.